Since 2010, we have officially become the supporting agent of Korea Tourism Organisation (KTO), established the cooperative relation and did multidimensional promotional activities on wedding and wedding photo. At the same time, we provide the four distinctive seasons, beautiful Jeju in Korea for nuptial couples to capture their wedding photos. In addition, we have published wedding service in Jeju to let more nuptial couples admire the gorgeous scene in Jeju. Not only do they have a chance to have an unforgettable wedding, but also a series of unique and perfect tailor-made wedding photos which could help them create a lifelong sweet memory. Aiming to get more nuptial couples know more about Jeju and different places in Korea, we expressively organised a series of activities with KTO in 2010 and 2011. We promoted and introduced Jeju wedding photo shooting and Korea photo shooting detail on different weddings and tourist magazines. We even introduced the key features of photo shooting and wedding in Korea, letting more nuptial couples know more about Korea. 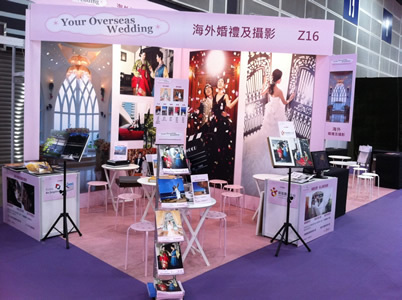 Furthermore, we participated in the Wedding Expo with the aids from KTO in 2 separate years 2010 and 2011 and introduce more about wedding in Jeju and details of wedding photo shooting in Seoul and Busan. Quite a few nuptial couples joined our wedding photo shooting service and wedding service in Korea during this occasion and enjoy their unforgettable Korea wedding photo trip. Due to the fact of the great support from the couples towards the pre-wedding photo shooting service in Korea, we have further released Seoul and Busan as the pre-wedding shooting venues in Korea under the support from KTO and the requests from nuptial couples. All our wedding photo shooting services are handled by Korean photographer, Korean Stylist and Korean wedding gowns borrowing services. Nuptial couples can borrow Hanbok and capture a series of Korean style wedding photos. Except Jeju, nuptial couples can also have their beautiful Korea wedding photo taken in the energetic Seoul city and romantic, coastal city – Busan.